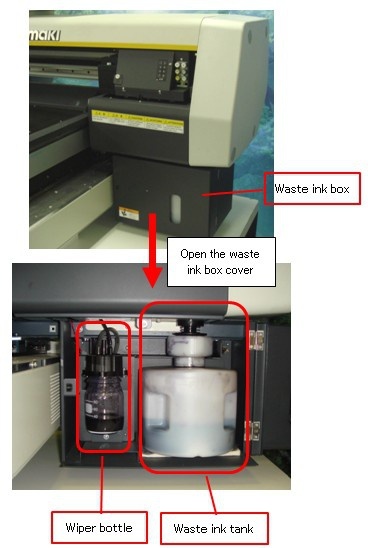 Waste ink used for head cleaning gathers in the waste ink tank and the wiper bottle.If the warning message “!WS INKTANK CHK” or “WIPER BOTTLE” appears, check the waste ink tank and the wiper bottle. You should periodically check the waste ink tank and the wiper bottle and dispose of the ink if they are full. The waste ink tank and the wiper bottle are placed in the waste ink box. For the detailed procedure, see OPERATION MANUAL -> “Chapter 4 Maintenance” -> “When the waste ink is full”.